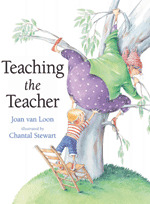 Teaching the Teacher, written by Joan van Loon and illustrated by Chantal Stewart (published by UQP 2008), humorously turns the tables on the teacher and child relationship. A young boy and his class mates decide to teach Ms Cherry what it’s like to be a child again at school. To hurry up and line up, sit cross-legged on the floor, climb a tree, and eat an apple with no front teeth. Learning is tough and Ms Cherry is finding out the hard way! But the class isn’t finished yet. Ms Cherry still has to learn how to climb the monkey bars, play dress ups, and dive-bomb in the swimming pool. The children lend a helping hand to their poor exhausted teacher who has fallen in a heap in the cushions. ‘Open your eyes. Wake up, please, Ms Cherry.’ The young boy is woken from his daydream by Ms Cherry and the class. Children and teachers will enjoy the lively water colour illustrations that depict the amusing events of school life. There are many opportunities for discussion, and this clever story reinforces the message that we never stop learning, whatever our age. what a cute book! I could see lots of creative writing opportunities with this one! Shelly B, I agree! I think kids' imaginations would definitely be fired up over the idea of swapping roles with their teachers. How adorable is the cover! I have to admit though, the mother in me is freaking a little at the tipping chair. HA! Can't help it. That cover is a real hook for young readers I think! It IS hard, just as it's hard to be a parent and a teacher sometimes. I like the idea of a role reversal though - maybe that's something we all should try occasionally!